The Omaha area has 12 private high school options. Located in Omaha’s Happy Hollow and Dundee neighborhood, Brownell Talbot is the State of Nebraska’s only co-ed and independent college prep day school for students in grades preschool-12th. The district boasts 100% of seniors going on to college, with high average SAT and ACT scores. Along with a demanding curriculum, Brownell Talbot additionally promotes community service and enrichment programs. Concordia Lutheran Schools of Omaha provides faith-based learning for students in kindergarten through 12th grade in West Omaha. The district consists of two buildings; Concordia Academy for students up through fifth grade, and a combined junior/senior high school for students in 6th-12th grade. Cornerstone Christian School holds classes for students in PreK through the 12th grade. Located in the suburb of Bellevue, the school first formed in the mid 1980s, focused on a student’s spiritual, academic and social growth. The school boasts high standardized test scores. As the State of Nebraska’s largest all-boys Catholic high school, Creighton Preparatory School enrolls 1,000 students. This Jesuit college prep school focuses on preparing young men for college, while at the same time preparing students for leadership in their future communities. Formerly tied to Creighton University, the Catholic-based high school offers small class sizes and students traditionally rank high on standardized tests. 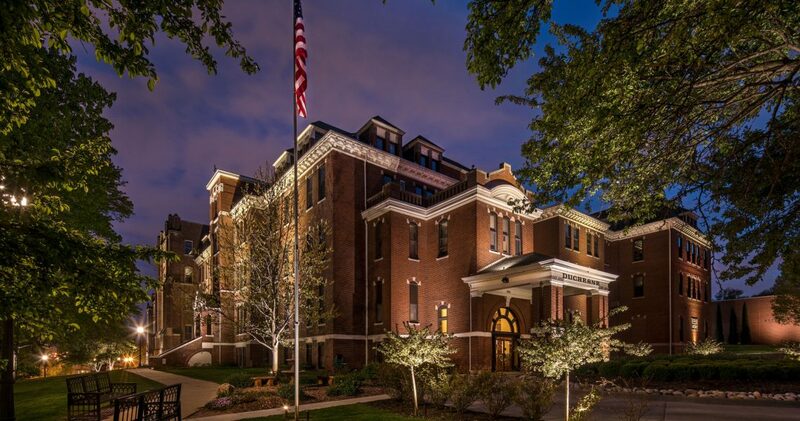 Located in Midtown Omaha, Duchesne Academy of the Sacred Heart is an independent high school for girls. The college prep school is a designated Blue Ribbon School of Excellence and fully accredited. Classroom work focuses on critical thinking and writing, with small class sizes and most graduates going on to college. In addition to the high school, Duchesne also operates a preschool for both girls and boys. Gross Catholic High School is a college preparatory school located in Bellevue. The school focuses on a Marianist education, with nearly two-dozen AP courses and honors classes offered to students. The high school also offers a number of dual enrollment courses. Marian High School is an all-girls, Catholic preparatory school located in Omaha. A two-time, Blue Ribbon School of Excellence winner, Marian focuses on delivering a faith-based, college prep curriculum to its students. With 100% of graduates going on to college, the school offers dozens of honors courses and advanced placement courses, while maintaining small class sizes. The high school also offers more than two-dozen sports teams and more than 50 clubs. Mercy High School delivers a faith-based, college prep curriculum to girls in the Omaha area. Accredited by AdvancED, the school integrates faith and service projects into its classes. With nearly 100% of graduates going on to the college, Mercy offers small class sizes, with a number of Advanced Placement classes as well as college-credit courses available to its students. Found in Elkhorn, Mount Michael Benedictine High School is a Catholic college prep school for boys. Owned and operated by an order of Benedictine monks, the school promotes small class sizes. Overlooking the Elkhorn River Valley, the school is a past National Blue Ribbon School winner, with a rigorous curriculum and a number of extra-curricular sports, as well as added academic activities. The school also maintains a five-day residential program. Omaha Christian Academy is a Christian college prep school located in Omaha. OCA offers its students a rigorous curriculum with small class sizes and Bible-based studies. The school serves students in preschool through the 12th grade. Roncalli Catholic High School provides a faith-based, Catholic education for students in the Omaha area. This co-ed high school partners with Metro Community College, becoming Omaha’s first college prep school to offer its high school students a Career Academy Program. V.J. and Angela Skutt Catholic High School serves young women and men in West Omaha. The co-ed high school opened in the mid 1990s, and has won a number of academic and athletic awards since then. The school prides itself on providing a high number of Advanced Placement classes and dual enrollment courses, plus offering students the option of earning college credit. The Blue Ribbon School also features extensive extracurricular programming.